Television has made the stars of many Canadian entertainers rise faster and shine brighter. Often, though, television viewers of an entertainment-based reality series like the America’s Got Talent global franchise, or even appearances on popular talk shows like Ellen, have no idea that the act they’re watching and rooting for are Canadian-born performers. Shin Lim’s masterful dexterity with a deck of cards is truly mesmerizing. 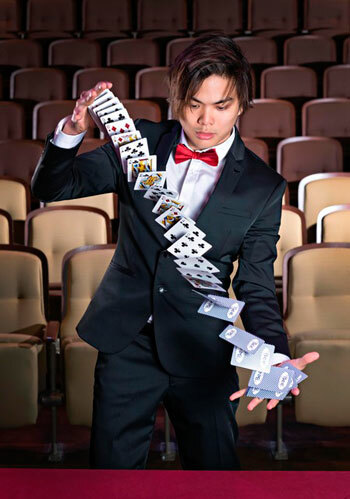 Trained as a pianist until he switched out keys for cards at age 20, Lim’s hands are graceful and lightning fast, with moves, no matter how closely observed, that defy detection. Born in Vancouver, Lim grew up in Singapore and Massachusetts. An award-winning magician, his close-up work managed to befuddle Penn & Teller on two seasons of their Fool Us television show. Lim was this year’s America’s Got Talent (AGT): The Champion’s winner, doubling down on his season 13 win. Choreographed to music, he tailor his acts to length and audience. Corporate performances often include two signature tricks. One involves a dreamy set where smoke and cards appear from Lim’s mouth. The other involves words and pictures hand-drawn onto cards by audience members, that disappear and reappear in a magical sequence. What’s not to love about smart pooches doing awesome tricks? North Bay, ON native Sara Carson and her Super Collies earned a fifth place final on AGT and a spot on its champion’s season. Not only did her stunt-dog act become a fan favourite, but each time Carson and her border collies took to the stage, tough judge Simon Cowell, a dog-lover, couldn’t stop grinning ear-to-ear. The troupe’s cast are all rescue pups, including Carson’s first star Hero who is also Ontario-born. Dubbed the celebrity dog trainer, show tricks go well beyond dog’s simply jumping through hoops, with performances that are set to music, play off a theme and tell a story. Carson’s work on the corporate circuit has the option of a show-and-keynote speech combo with topics that range from inspirational coaching to observations on human and animal instincts. Some magicians use cards and rabbits. Ryan Stock, however, opts for chainsaws, lawnmowers, hooks and blow torches as the tools of choice in his off-the-wall, unforgettable stunts. Dubbed the “Comedy Daredevil,” Stock delivers cringe-worthy-yet-can’t-look-away fascinating and dangerous performances as he executes extremely physical feats like swallowing swords, eating fire and inserting objects into and through his nose. Partner AmberLynn Walker is just as impressive, appearing so calm and cool as she assists Stock in his trademark zany stunts, such as shooting a cross-bow arrow at a target he holds in his mouth. The couple hails from Alberta – him from Edmonton, her from Calgary. In addition to hosting three seasons of their own TV series called Guinea Pig on the Discovery Channel, the pair have appeared on major network shows including Ellen, The Tonight Show With Jay Leno and two AGT seasons. Stock’s unique derring-do has earned him several Guinness World Records entries. Performed with a side of tongue-in-cheek comedy, the act is customizable to event purpose and theme. 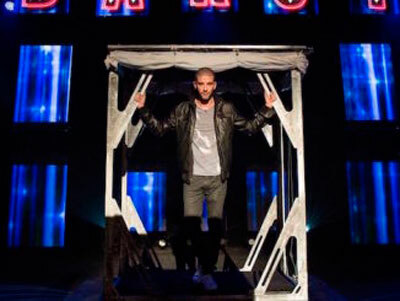 Winnipeg native Darcy Oake is a performance artist and modern interpreter of the art of illusion. His shows are breathtaking, filled with logic-bending, mind-blowing stage magic featuring grand spectacles like daring escapes and into-thin-air disappearances. Oake’s breakthrough moment was on Britain’s Got Talent in 2014. Since then, performances have included a private show for the Queen of England’s 90th birthday, on AGT, plus stage and television appearances as part of The Illusionists, a famed troupe of stellar magicians. Performance sets range anywhere from 30 to 90 minutes and can be customized according to venue size and client requests. Popular signature illusions include his Bird Act, which involves making multiple birds appear from nothing. It is a technically difficult sleight-of-hand display with a finale of all of the birds visibly turning into a girl. There’s also the Bear Trap that sees a straight-jacketed Oake suspended by his ankles 20-ft. above a human bear trap. It’s a race against time to escape before a flame burns through the rope dropping the magician into the trap. Making 70 hula-hoops defy gravity all at once snagged Christina Munchinsky a first place win in the Ellen Degeneres Show’s Here’s my Talent competition. Known as Christina the Crazy Hooper, the Victoria, BC-based performer, born and raised in Brandon, MB, has been hula-hooping her way through life since she was five. Energetic, bubbly and enthusiastic, she’s a favourite at festivals, corporate and community events and public showcases across North America. She was also a contender on TV’s short-lived Canada’s Got Talent (CGT) competition. Energy filled and musically dynamic, Munchinsky’s routines demonstrate incredible dexterity as she moves and dances with the spinning hoops. Her repertoire also includes hula-hooping a tractor tire inner tube and performing while on a unicycle. She also now has a personal best of rotating 111 hoops around her waist. 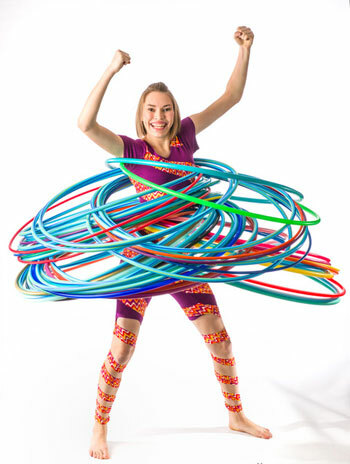 An extremely engaging performer, Munchinsky often invites the audience to try hula hooping. In fact, an entire workshop is available that teaches participants hooping moves, from simple to more complex. A man, his mouth and a microphone … that’s the talent trifecta that belongs to Scott Jackson, an award-winning beatboxer. A finalist on CGT, the Toronto-based performer wows audiences with his unique mash up of music, combining everything from sound effects to beatboxing and singing at the same time to replicating well-known songs and complicated rhythms. Jackson’s beatbox shows are high-energy and crowd pleasing. 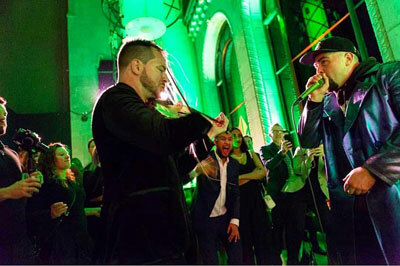 As a solo act, Jackson tailors performances to the occasion and client taking on song requests and creating custom pieces using employee names or corporate sponsors. The beatboxer also collaborates with Eugene Draw — Dr. Draw — violinist supreme. Called Nemesis, the duo push the pairing of voice and violin as far as they can go in delivering wildly energetic performances. Show content covers a vast array of music genres influenced by different cultural beats and includes selections themed to preference such as holiday or ’90s dance. Brotherhood is a hip-hop crew based out of Vancouver who are rocking the dance scene with their synchronized moves and athletic choreography. Their routine on last year’s World of Dance qualifiers was a clever nod to Canada’s passion for ice hockey, performed before “dance royalty” that included judges Jennifer Lopez and Derek Hough. The 11-man troupe, led by founder and choreographer Scott Forsyth, is also two-time World Hip Hop Dance Champions, and are in-demand performers at competitions and events around the world. Brotherhood shows are electric, seamlessly executed with great costuming and song choices along with an entertaining story-telling-through-street-dance sensibility. Routines are customizable to length and theme. The dance crew also offers workshops that make for unique team-building activities, especially for millennials and younger crowds. Port Dover, ON native Lucas Wilson has made a name, and a career, on setting Guinness World Records for the fastest escapes from a straightjacket and chains while hanging upside down. The fresh-faced illusionist with a charming smile and congenial personality even pitched, and won, sponsorship dollars from television’s Dragon’s Den. Assisted by Kelly Defilla — theatre bonded their friendship in high school — the pair have also appeared on The Today show and CGT. Wilson’s Houdini-style stunts are all part of his action-packed magic show. Family friendly and fun, performances feature lots of audience participation opportunities. He styles his shows to fit guest demographics and venue, from grand illusion stage spectacles where he walks through industrial spinning fans to teasing out a little corporate humour by sawing the company CEO in half. A popular inspirational speaker, Wilson incorporates his magic into keynotes around goal-setting topics for school assemblies, fundraisers and corporate conferences. Interactive, hands-on magic workshops are also available, tailored to age and learning purpose.